Happy Valentine’s Day! I’m leading my four kidlets on a wild goose-chase-of-a-scavenger-hunt today with a loosely put together Valentine’s theme. I had big plans for a wonderful, fun Valentine’s dinner and then my husband had to up and leave town on a business trip so we are fending for ourselves. No worries – long gone are the romantic Valentine’s Days of yesteryear. We celebrate family-style these days and while the kids and I won’t be enjoying the gourmet meal I had planned before, we’ll still have a great time chowing down on our noodles smothered in creamy alfredo sauce (my go-to dinner when Brian is out of town) and we’ll reschedule our Valentine’s dinner festivities when dad gets back. Until then, I’ll keep myself preoccupied dreaming of these oatmeal chocolate moon pies. Kind of homey, in an oatmeal moon pie way, this version manages to also check off decadent, satisfying and ridiculously tasty. 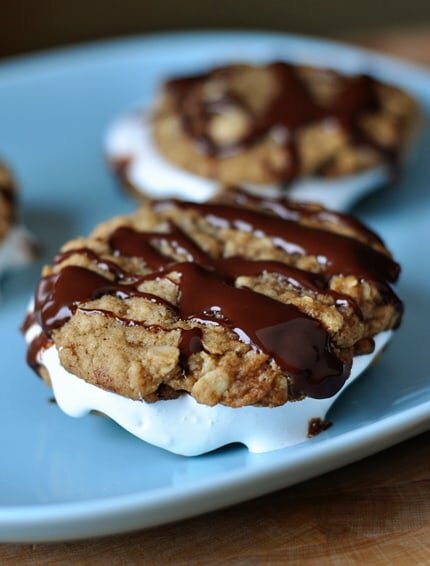 Fairly simple in concept, a sturdy, yet still soft and chewy, oatmeal cookie becomes the sandwich for gooey marshmallow creme and the entire moon pie is drizzled in a dark chocolate ganache that will have you shamelessly licking the bowl clean post-drizzle. Fun and simple enough for kids and yet still classy and gourmet enough for the adults in your life, these moon pies are a new favorite treat of choice around here. A fellow mom warning to all you other moms out there: I will confess these might potentially be the messiest, stickiest dessert we’ve enjoyed in a long time. So be prepared with some wet wipes. Or a bath. It will be messy. But it will be worth it. Promise. Especially when you can eagerly devour the extra moon pies while the kids are getting cleaned up. Preheat oven to 350°. Line baking sheets with parchment paper or silpat liners. Using an electric mixer, beat butter and sugar in a large bowl, occasionally scraping down sides of bowl, until smooth, about 2 minutes. Add egg and vanilla and beat to blend. Scrape down sides of bowl. Add the flour, baking powder, soda and salt. Mix. Stir in the oats, pecans and chocolate chips just until combined. Scoop out about 1 1/2 tablespoonfuls of dough at a time and roll into balls. Place on a baking sheet about 2 inches apart. Press down on each dough ball until it is about 1/2-inch thick. Bake the cookies for 9-11 minutes until lightly golden and set around the edges. Remove the cookies to a cooling rack to cool completely. Repeat with the remaining dough. Up to an hour before serving, make the chocolate ganache for drizzling by placing the chopped chocolate and honey in a small bowl. Bring the cream to a simmer in a small saucepan or in the microwave (watch carefully so it doesn't scorch or overflow!). Pour the hot cream over the chocolate and let the mixture stand for 1-2 minutes before stirring. Whisk or stir until the chocolate is melted and smooth. Set aside. Spread 1-2 tablespoons marshmallow creme on the bottom of half of the cookies. Top with the remaining cookies. Drizzle with the chocolate sauce and serve immediately. As I noted above, if the marshmallow creme is put on the cookies too far in advance, the cookies will slide around and the marshmallow creme can get extremely sloppy and gooey. I recommend assembling the cookies no earlier than 15-30 minutes before serving. If you have to do it farther ahead, they may not look as pretty but will taste delicious. The cookies can be made up to 2 days in advance and stored in an airtight container (yippee!). 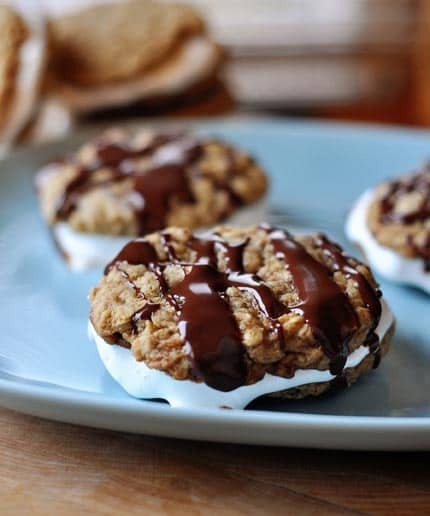 I recommend assembling the cookies with the marshmallow creme as soon as possible to when you want to serve them as the marshmallow creme tends to get sloppy, extra gooey and leaks out of the cookie sandwiches. If you absolutely need to assemble them earlier (like I did), prepare yourself that they may look messy but will taste absolutely delicious. I know that you have used a Bosch, I saw your bread recipe. Have you tried the new Bowl Scraper? I love mine for cookies and especially cheesecakes. I can’t wait to try these. marshmallow creme is up there with puff pastry and nutella on my list of outstanding and can’t-live-without-’em ingredients. How cute and yummy do those look!!!? My kids would love these! Thanks for sharing. I love moon pies and yours look perfect, Mel! 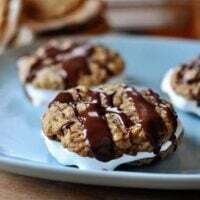 Love your spin on them with oatmeal and pecans…. mmmm. These look delicious! I like the use of honey in the drizzle. I wanted to let you know that I made that steak/pasta last night and your red velvet cake. I was too full to try the cake but my boys gobbled it up. I’d say the pasta dish was pretty good. The sauce was a little thin I thought. We did copy your candlelit idea and our boys thought it was so neat. Thanks!! Those moon pies look awesome! Mel, you are truly amazing with your recipes. I made several Valentine boxes and they were a hit for today. Thank you for sharing your idea. Would you by any chance have a PDF version of the ‘Thank You’ letters that you could post also? Thank you! Yum! I was looking for a recipe the other day f0r marshmallow creme. Now that I know you buy it but the jar I have no problems doing the same. Happy Valentines day! Happy Valentine’s Day, Mel! We celebrate family style, too. Have fun with your boys today, and have fun celebrating when Brian returns from his trip! I used to love Moon Pies – these sound sooo good!